Current Page: Xilisoft > iPhone Magic > How to manage iPhone? How to manage iPhone with ease? Featured as iPhone manager, Xilisoft iPhone Magic integrates with all solutions to transfer, backup and manage music/movies/photos/books between iPhone and computer. 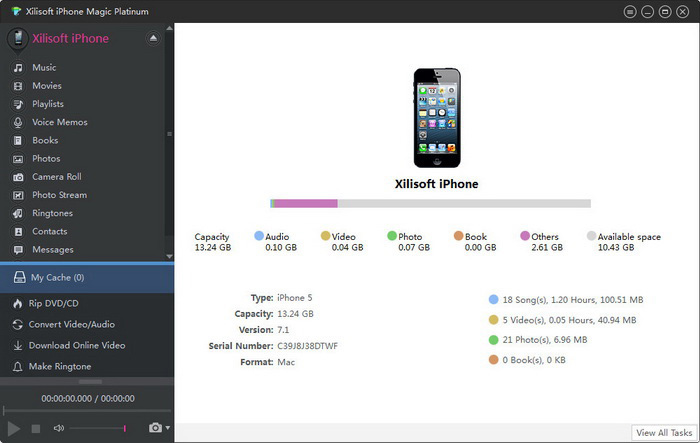 You can manage iPhone well with Xilisoft iPhone Magic. Download iPhone Magic(for free)and fellow the tutorial. Install and lauch the iPhone Magic. (1)Choose the files then click "Add Files to Device" button to add flies to iPhone. (2)Choose the files then click "Copy to other devices" button to export files from iPhone to other devices. (3)Choose the files then click "Copy Files to Computer" button to export files from iPhone to local driver. (4)Choose the files then click "Copy Files to iTunes" button to export files from iPhone to iTunes library. ☆ Play iPhone videos/music and DVD movies in the built-in resizable player.